We will be reducing the herd due to human health issues, so most of the senior does are for sale this spring/summer. I would like to have them leave for their new homes in milk after they have weaned their 2019 kids. They all tested negative again for CAE, CL, and Johne’s in December 2018 and Ohio is a Brucellosis and Tuberculosis certified-free state. They are all from great bloodlines and I expect that they would all earn their milking stars (if they don’t already have them) and be terrific show does too. Chai Tea returned to Bramblestone Farm in 2017, and we’re so happy she’s back! She left as a baby in 2013, but her dam and siblings have done so well in milk production, showing and linear appraisal that I decided to bring her back. 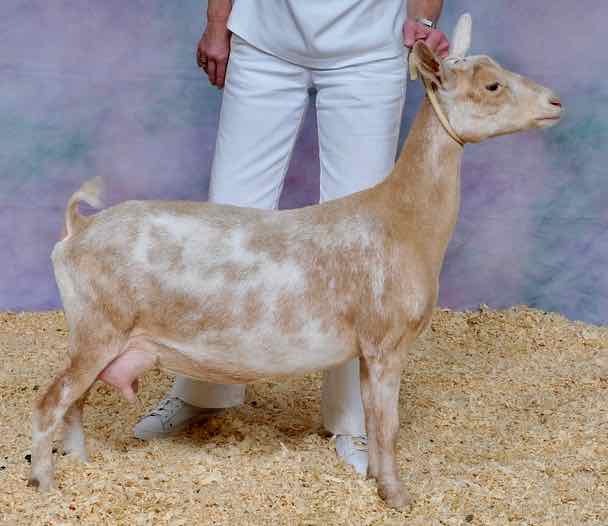 Chai Tea is also the daughter of Old Mountain Farm Palindrome, the 2011 AGS National Reserve Grand Champion. Chai promptly decided to join the party too by scoring an 88 in her first linear appraisal as a second freshener and earning her 4th generation milking stars her first time on milk production test! Then, in her very first show, she was Reserve Grand Champion! She also did the best of any of our does at our first attempt at a National Show by coming in 14th in her class of about 70 does. Click here for Chai Tea’s page. 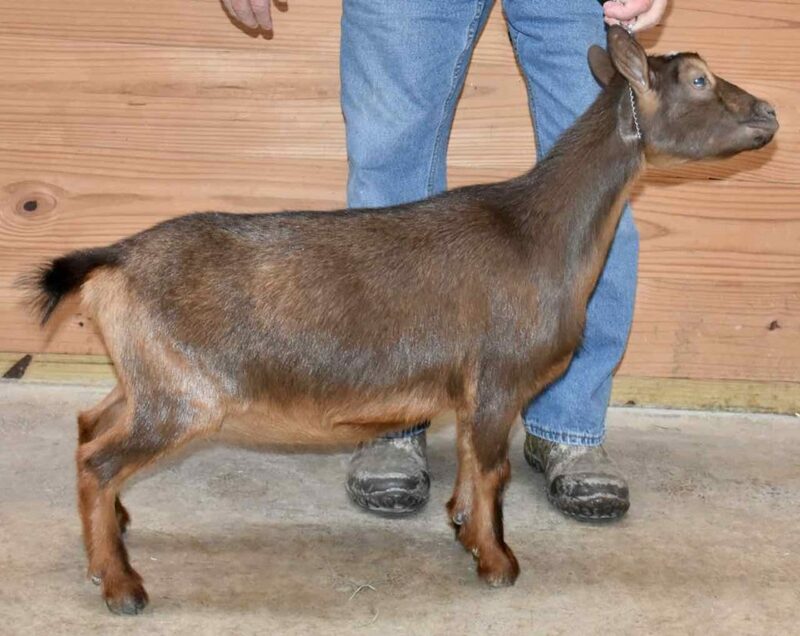 Sun Tea is the daughter of 3*M SG AR Old Mountain Farm Hot Tea 3*D and CH Old Mountain Farm QuentinQuinn (aka Q), two goats that are really conformationally outstanding. Sun Tea certainly seems to be living up to the terrific genetics in her background. As a first freshener, she earned her AGS milking star, making her a 4th generation star milker. And, in her first linear appraisal (as a first freshener) she scored an 88! Then, she won Grand Champion Doe and Best In Breed! Sun Tea far exceeded my expectations as a first freshener and has really set the bar for our other goats. As a second freshener, Sun scored an 86 in linear appraisal and as a third freshener, earned her ADGA milking star and an 87 in linear appraisal! Click here for her four generations graphical pedigree (with both ADGA/AGS awards/recognition). and when she finally did I couldn’t resist buying her. She very nicely put together and even though she was still stressed from moving to our farm, she scored an 88 in linear appraisal as a second freshener. That’s a very good score for a second freshener and a good indication that she’ll continue to improve. 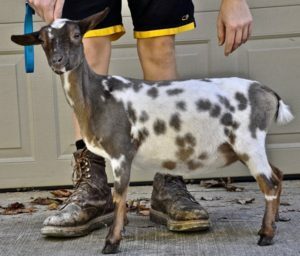 She comes from beautiful bloodlines that are competing successfully at the National Show level. Click here for her four generations graphical pedigree. Click here for Pearl’s page. Ostara Quinn (aka Tara) looks like a “mini-me” of 5*M Old Mountain Farm Taylor Quinn *D (her dam) and they also seem to have similar personalities. Taylor is a very inquisitive and robust doe from Old Mountain Farm with beautiful conformation, so we’re happy to see Tara maturing in a similar fashion. Taylor is a 5th generation star milker and I think Tara will have no problems getting her milking star and becoming a 6th generation star milker. Tara’s 1st freshening udder is quite impressive and she scored an 87 in linear appraisal! That’s very good for a first freshener. Tara is also polled. Click here for Tara’s page. 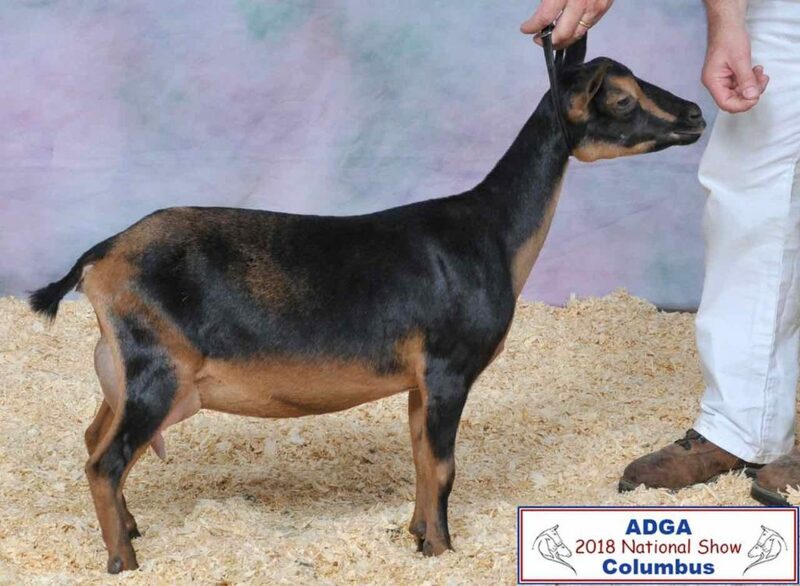 Harle Quinn is the grand-daughter of the 2012 ADGA National Grand Champion Senior Doe (2*M GCH Buttin’Heads Paperclip), and we think she looks a lot like her Granddam. All of our 2016 retained first fresheners were great looking young does that appear to be improvements conformationally, but Harle Quinn is looking exceptionally nice. 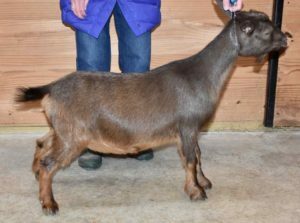 She’s the only non-polled goat that we retained in 2016, but she was just too good-looking to sell. Click here for her four generation pedigree (with both ADGA & AGS awards/recognition). Click here for Harle Quinn’s page. SisLee and arrived in late summer/early fall of 2018. We’re quite excited about her joining Bramblestone Farm. 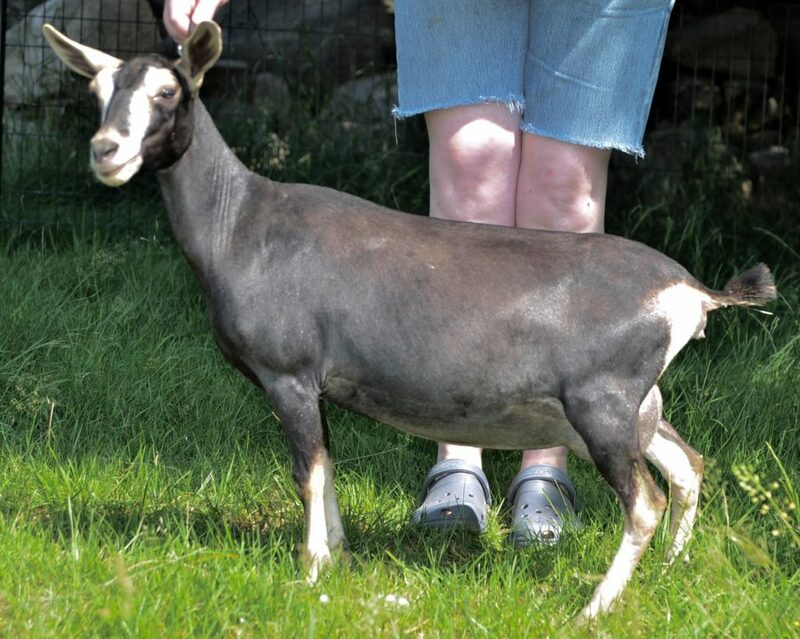 SisLee is the daughter of 2*M SG NC Promisedland Nemesis 2*D, a doe that is quite spectacular looking. Her Linear Appraisal score at 9 years old was 90 VEEE! She has also produced many gorgeous offspring. 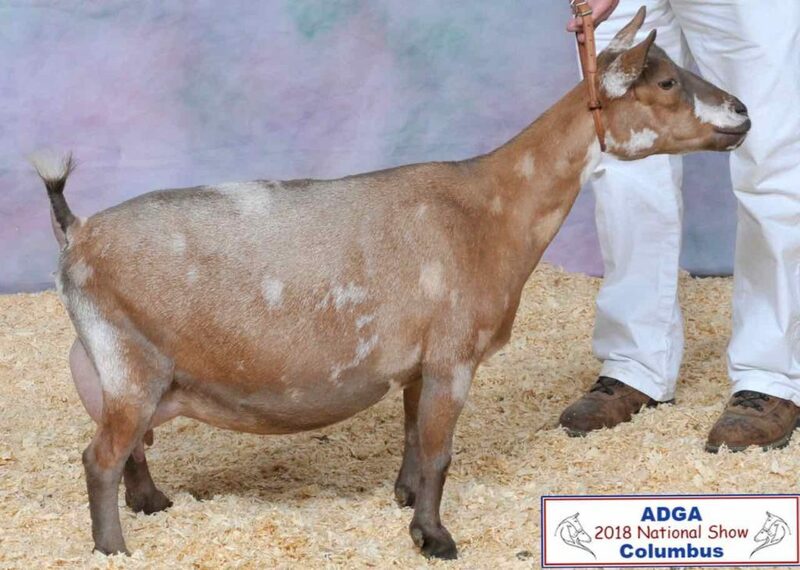 Most recently, SisLee’s half-brother (Old Mountain Farm Bold Elk) is the sire of the 2018 ADGA National Reserve Grand Champion doe 2*M SGCH Old Mountain Farm Shy Elk. Shy Elk scored a 92 EEEE in linear appraisal. Click here for SisLee’s page. Eilis is another 5*M Old Mountain FarmTaylor Quinn 5*D daughter that we retained because of her good looks. This picture does not do her justice, I didn’t get her photo done before her coat was already growing out in the cooler fall weather. We believe she’s longer with a straighter topline and more brisket than her dam displayed – and her dam is a gorgeous Old Mountain Farm doe with beautiful conformation, udder, and attachments. Eilis is primarily bred on OMF bloodlines and has many star milkers and champions in her pedigree. So, we’re looking forward to seeing her first freshening udder and kids this spring. Click here for Eilis’s page (coming soon). 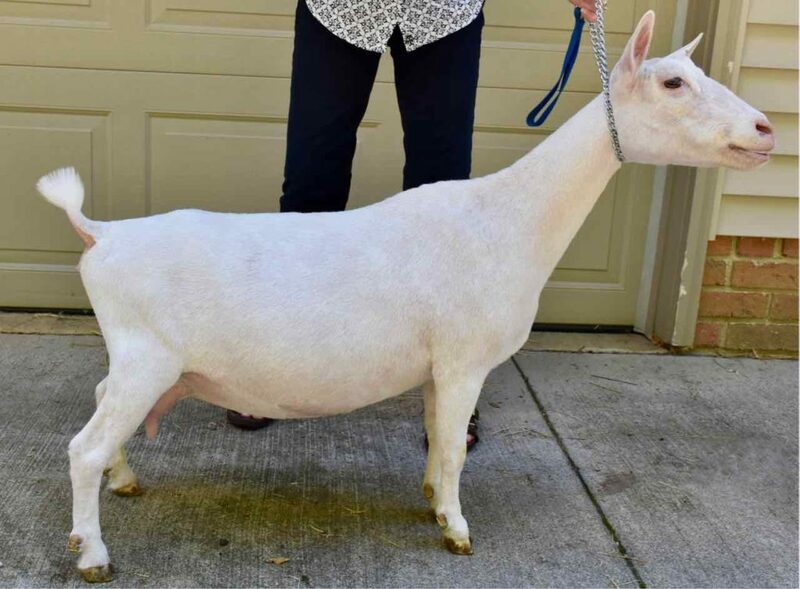 Windsong is another grand-daughter of the 2012 ADGA National Grand Champion Senior Doe (2*M GCH Buttin’Heads Paperclip), and half-sister to Harle Quinn above. Both their dam and grand dam were prolific milk producers with gorgeous udders. Click here for her four generation pedigree (with bot ADGA & AGS awards/recognition). Click here for Windsong’s page.